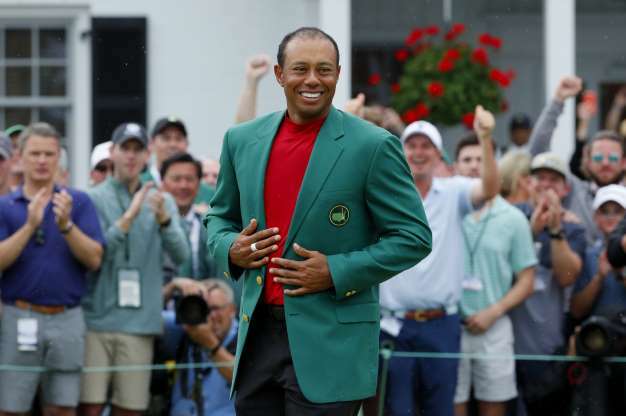 Tiger Woods of the US celebrates with with his green jacket and trophy after winning the 2019 Masters. The Official World Rankings for Golfers were updated on Sunday evening and the final-round rally win for Tiger Woods at the Masters in Augusta, GA., catapulted him into sixth place. The 43 years old sports personality entered the tournament in position 12 in the world, this equaled his highest ranking since late in the 2014 season. Woods has dropped as low at 1,199th in the rankings, this was during the period he underwent various back surgeries and there were doubts he would ever play again.